A Photoshop alteration raised alarms over a pretty model in a burnt orange dress, who appeared to have had a run-in with a very heavy airbrush. The devilishly bad piece of retouching at Simply Be left the brunette with an apparently freakishly clawed left hand, complete with six fingers and right-angled gashes. 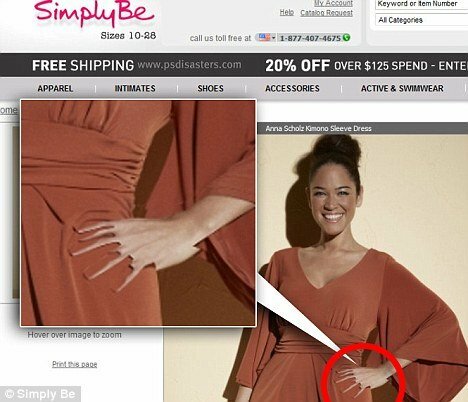 Alongside the sharp digits, the unwitting model’s right hand was given a stumped, forked thumb. The alteration begs the question of whether the rest of the image – including the dress for sale – has been unrealistically and misleadingly enhanced. After the story made its way onto Jezebel, Simply Be quickly changed the image to something for more human and less ghoulish. The kimono dress is now worn by a model who, the site acknowledges, is a “non-mutant” – and, thankfully, rather more attractive – version. As if Photoshop hadn’t already had enough criticism of late, the blunder adds fuel to the anti-retouching lobby. Moves to restrict the use of retouching on commercial images are gaining momentum, no thanks to the embarrassing backlash that airbrushing errors such as this creates. On the basis of a poll that found that readers were increasingly feeling deceived by commercial images, Glamour magazine has just announced that it will ask commissioned photographers not to alter the shapes of models – even if a celebrity requests a ‘digital diet’. No matter how beautiful or famous, celebrities and models alike regularly fall foul of over-zealous retouching – with some companies, such as Makeup Forever, increasingly making a point of only publicizing entirely unaltered images.